This project is a quick and simple gift to give a bride and groom. I actually did this the day of the wedding that is how easy it is. 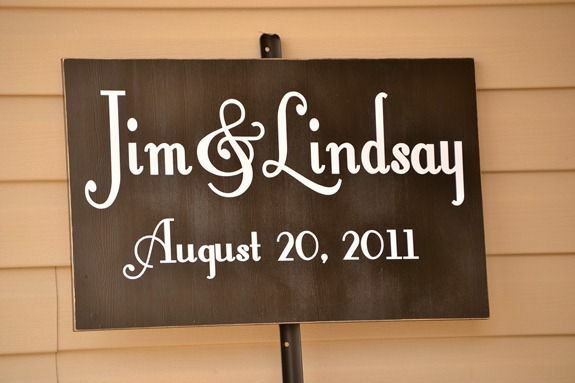 This personalized wedding sign is a wonderful gift because it serves two purposes. The first is to give the guests directions when they arrive at the church and reception. Secondly, it can serve as a beautiful piece of art gracing the walls of their new home. 1. I just found some boards I had in the garage and just cut them evenly since they were a wonky size. Mine ended up being 23” wide by 14” tall and then the arrow was 14” wide by 12” tall. 2. I primed them, lightly sanded, and then painted black. Then I distressed the edges ever so slightly. 3. Next I cut out the vinyl in my Silhouette Studio program and cut it out with the Silhouette SD. I used the free font Fontleroy Brown. Since the names were so long I cut out the name first and then the date and then the arrow. 4. Then I transferred them onto the board with transfer tape. 5. The metal stake I got only came in green so I quickly sprayed that with some black primer. Then I screwed the board into the stake. I stuck it in the ground at the wedding, then quickly moved it to the reception and then grabbed it at the end of the night. When the love birds came home from their honeymoon I gave it them as a gift. The New Silhouette Cameos just arrived and are ready to ship. If you use the code: IHEARTIC you can get a brand-new CAMEO and your choice of a starter kit (Fabric Ink, Vinyl, Heat Transfer, Rhinestone) for $299.